Ann went to visit the Cat Register and Rescue Charity in Falkirk recently. She was knocked out by their hospitality and had nothing but admiration for the work they do. Catsup has a limited number of CRR playmats for sale. All profits from their sales will be sent to the CRR. The boys love the playmats their adopted brother Ricky sent them for Christmas. Read about the work of the CRR and find out how to buy a playmat below. The Cat Register and Rescue is a small charity working in the Falkirk area of Scotland. They rescue strays, have them neutered and, whenever possible, find them homes. Healthy ferals who are capable of existing in the wild are returned to their colonies once they have been neutered. Cats who cannot live independently and who, because of age or infirmity, are unlikely to find homes are fostered by the charity for the rest of their lives. The charity has a "no kill" policy. What really stands out from the moment you meet members of the charity is the love they give to all the cats in their care. Each cat has a name and responds to it. The carers know all of their orphans' idiosyncracies and, if they possibly can, they cater to them. This has resulted in Riley, a cat with a heart defect taking up permanent residence in his carer's bathroom, away from the hurly burly of the other cats. Enter and you will find a a beautifully groomed, grey, longhaired resident, at complete ease on his bed. A litter tray is within easy reach and food is nearby should he feel peckish. Any attention you care to give him is welcomed. Annie likes to spend most of her time on top of a kitchen cupboard. Look up and there she is, sitting comfortably in the basket that has been placed there for her. Thoughtfully surrounded by a modesty screen is her litter tray. Her carer has to climb onto the worktop twice a day to retrieve it. The work the carers do is mind boggling. When you live with 18 or, in one home, 30+ cats, there's no room for laziness. Floors are washed 3 times a day, the cats' food is served on sparkling white plastic platters and litter trays are cleaned as soon as they are soiled. It's a full time job - and then some! Spock is happy to recommend the catnip mice to all cats. The two that arrived with their playmats have become his favourite toys and he even brings them up to bed with him every night for a quick play before he settles down to sleep. Not one of his better ideas as far as Ann is concerned! The catnip Rita and Lisa use is powerful stuff! Dracs, who rarely plays, spends a lot of time sleeping peacefully in front of the fire on the playmats. I can recommend these playmats. Not only is mine good to lie on, but I can have a great wrestle with it too. Now what did I do with that mouse? We thought we'd let you know that the playmat arrived today and has been a big hit! Muffin in particular loves it, as you can see from the photo. 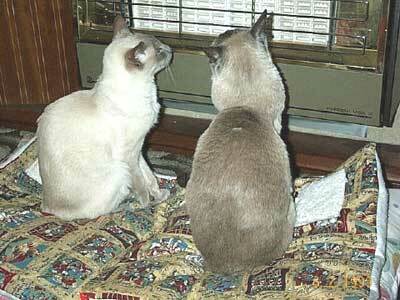 That's Cassie sitting on it, with Ming watching Muffin who's in action with one of the mice. Our mice have vanished already. I think we'd have to talk to Muffin and Ming if we want to know where they are. I'm sure they know exactly where they left them, they usually do. This playmat's mine and I'm not sharing it with anyone! You can also help the Cat Register and Rescue by adopting one of their orphans. It only costs £10 a year and you will receive an adoption certificate, information about your chosen orphan and updates. Orphans have even been known to write to their Adopters themselves! (Three of them, Bernard, Ricky and Anthony, have submitted their profiles to Catsup and won our Cupwinners Award.) To find out more about adopting, Click here. To visit the Cat Register and Rescue's own website, Click here. Don't forget, we now accept payment via Paypal if you prefer to Email your order to us.